A lot of things can make your heart beat faster, like kissing the person you love or watching a scary movie. But sometimes, your heart beats not only faster but also out of rhythm. That can be a problem if this continues over a long period of time and isn't treated. 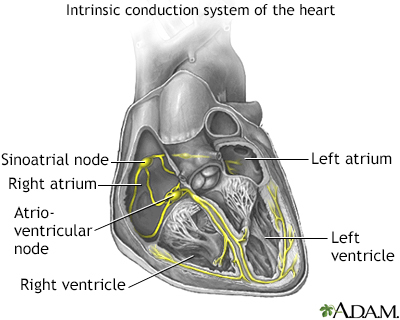 Let's talk about a condition called atrial fibrillation. If you can listen to your heart through a stethoscope, your heart beat should sound something like this, or lub dub, lub dub, lub dub. 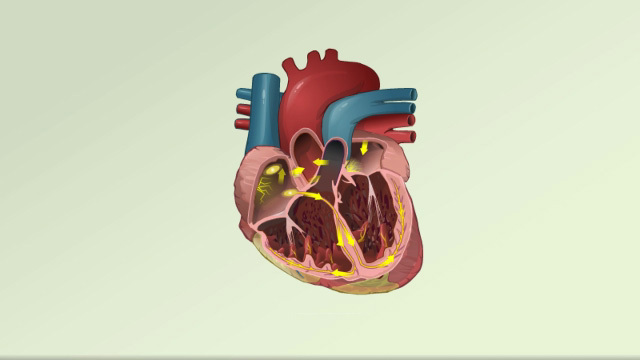 If you have atrial fibrillation, the top two chambers of your heart contract too quickly, and in an irregular pattern. So what you'd hear if you listened through a stethoscope would be more like this. Atrial fibrillation doesn't just sound funny, this irregular beat can prevent your heart from pumping enough blood out to the rest of your body. Age may cause atrial fibrillation. As you get older, it's more common to have an irregular heartbeat. You're also more likely to have atrial fibrillation if you've had another heart problem, like valve disease, coronary artery disease, or heart failure. Some people get atrial fibrillation because they drink too much alcohol or take certain medicines. To find out you may have atrial fibrillation. You'll feel your heart race and flutter-and not just once in a while, but often. You may also have trouble breathing and feel tired and dizzy. Your doctor can listen for fluttering while listening to your heart with a stethoscope. You may also need a test that records your heart's rhythms, like an ECG, which you have in your doctor's office, or a Holter monitor that you wear around for a day. Your doctor may also prescribe imaging tests to look at your heart and check whether its electrical system is working properly. If you do have atrial fibrillation, your doctor can give you medicine to slow your racing heart. Often, the next step is to restore the normal heart rhythm with an electric shock, a process called Cardioversion. However, if the atria haven't been contracting well for 48 hours or more, blood clots may have formed there. These patients are usually given anti-coagulant medicines before Cardioversion to prevent the clots from moving to the brain and causing a stroke when normal rhythm is restored. If Cardioversion doesn't solve the problem, a procedure called Cardiac ablation can be done to destroy the bad areas of your heart that are causing your heart to beat abnormally. Usually doctors can treat atrial fibrillation so that it becomes a minor nuisance, instead of a big problem. But, the condition can come back, even after it's been treated. 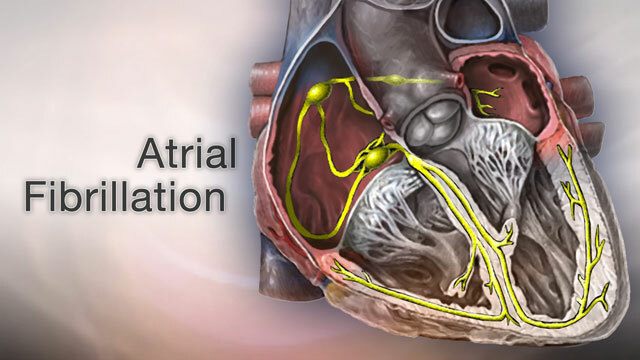 If it continues, atrial fibrillation can lead to heart failure. To avoid complications from atrial fibrillation, call your doctor if you're feeling flutters in your chest, and they don't go away.